Photo measuring 3.5 x 4.5 inches. Am I correct in thinking these are servants? That house certainly looks big enough to call for help. 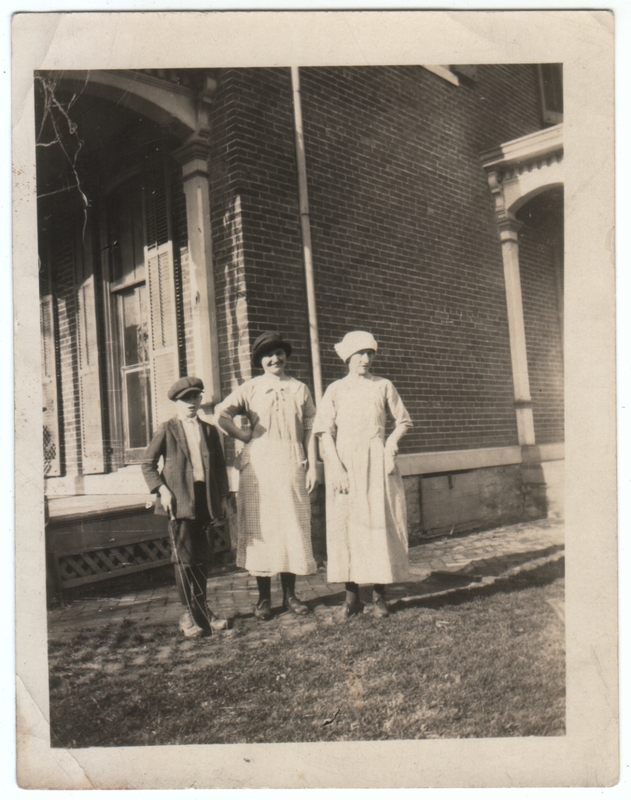 I could be way off base, but if I had to guess, I’d say that’s a nurse on the right, a cook in the middle, and some sort of all-purpose boy on the left. The boy could just be some lonely only child who bides his time by ingratiating himself with the household staff, but he’s holding what I believe is a rug beater, and it seems odd to think that the family’s son would be out beating rugs. Also, I recently saw that “Benjamin Button” movie, which put the idea in my head that this might be something like an old-folks home, rather than a single-family estate. Whoever they are, and wherever they are, they at least seem content enough. I lean towards it being some kind of institution or business. If it was a home, I would think the grounds would be well kept or even have plants. Yes, good point, although a lack of plants might be the case if the house was brand new. Hard to say. This is one of those photos that could have a hundred stories behind it. I like it. How did you like Benjamin Button? It’s very different, but I really like that movie. I agree about the photo. As for the movie, I had minor quibbles, but I mostly liked it, and parts of it were quite outstanding. I’m curious to read the short story. The only Fitzgerald I’ve read is “Gatsby”, which felt to different. Plus, since it was an epic movie made from a short story, I’m curious to see how the source material differs (if at all).